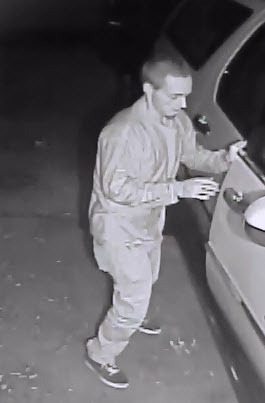 PORT ST. JOHN -- The Brevard County Sheriff’s Office is currently investigating several vehicle burglaries that occurred in the area of Stillwater Avenue in Port St. John, Florida. 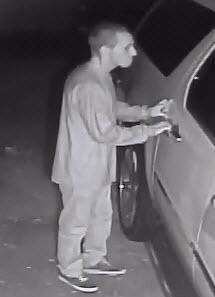 During overnight hours of May 2-3, 2013, an unknown male was recorded on a surveillance video burglarizing several vehicles. Based on the surveillance video, the suspect is described as a white male, approximately 5'06 - 5’08”, slim build, short hair, wearing dark pants and a darklong sleeve shirt. Deputies say that the suspect entered the vehicles through unlocked doors, taking valuables and prescription medications. All calls to CRIMELINE are confidential, and callers can remain anonymous and are eligible for a reward for information leading to an arrest.